Born in Shropshire, England in 1984, Laurette Evelyn has always had a love of music. With a classical background in singing, she imbues her vocals with a striking clarity that is rarely heard in modern genres. 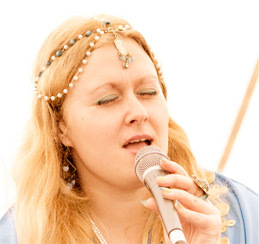 Having previously won first place at the prestigious Oundle music festival, Laurette has taken her extensive vocal experience and applied it to many varying styles, finally creating her own distinctive sound. She has recently finished creating the album "Alone", a work that reflects her cross-genre influences, seamlessly blending elements from folk, jazz, rock and even pop. Laurette is joined by Cambridgeshire-based guitarist Chris Watson, who is also featured on the album playing mandolin, drums and bass guitar. The album’s debut single, “Alone”, is a fresh take on folk-rock; a genre both Laurette and Chris hope to bring in to a bold new era.